RICE ice core cut plan according to the countries responsible for different analyses. 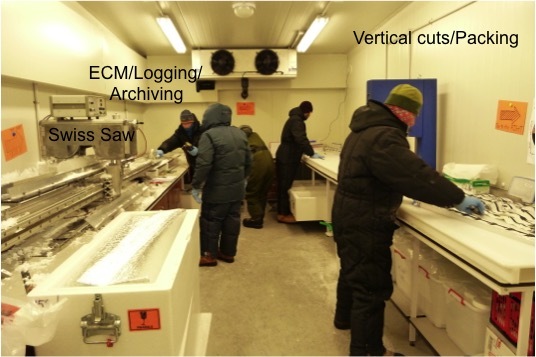 Ice cores were split, logged, cut (horizontally & vertically) and measured for conductivity (ECM) in the cold laboratory. Samples for the continuous flow were then sent to the clean laboratory for analysis. Sample processing in the clean laboratory included continuous flow analysis (CFA), where a continuous stream of melted ice was analyzed by several instruments different instruments. Check out the gallery to see examples of the CFA process.